Becky and I both have a gluten allergy, and Becky also has a dairy allergy, so we are a lot of fun to travel with when it comes to finding a good spot to eat. We know firsthand how much anxiety is involved in something as simple as eating a decent lunch that won’t end up ruining the rest of the trip, and that is also delicious enough for our gastrically-unchallenged friends. Whenever we find a yummy spot that fills these needs, we are going to share it with you; if we mention a yarn shop without a corresponding lunch suggestion, you can safely assume that we lived on Kind bars or Chipotle that day. The wonderful knitters of Four Purls wholeheartedly recommended Bambu Café, a smoothie and juice bar in easy walking distance from the yarn shop. Instantly upon walking in, I could just tell that our uber sensitive tummies would be happy here. Every day there are different varieties of egg, tuna, and chicken salad, in addition to each of them being classically prepared. Once you choose your protein, you get to choose if you want it on your choice of their homemade bread (including gluten free bread! ), on a salad (again, classic or one of several varieties), or alone. 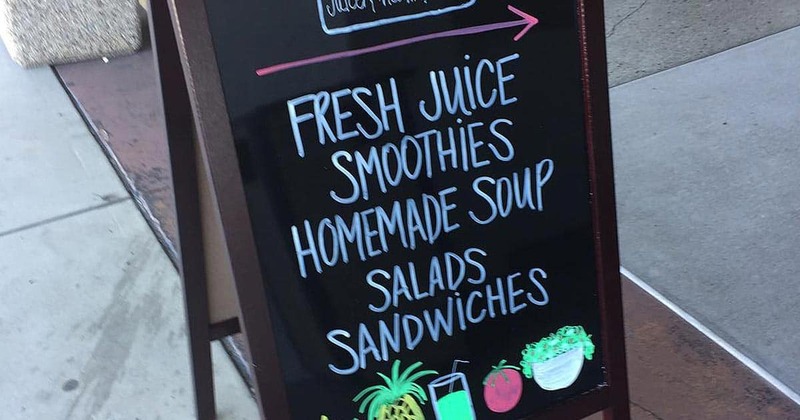 There are also lots of healthy smoothies to choose from, most of which are available without dairy. I had a scoop of classic chicken salad on top of a kale salad with fresh local berries, and a strawberry basil-infused water. They even have gluten-free croutons!! And hibiscus kombucha! Thinking it’s “too healthy” for you? A guy at the next table over had a grilled chicken sandwich on a croissant, a cup of homemade soup, and a chocolate and peanut butter smoothie. The only downside? They’re closed on weekends. 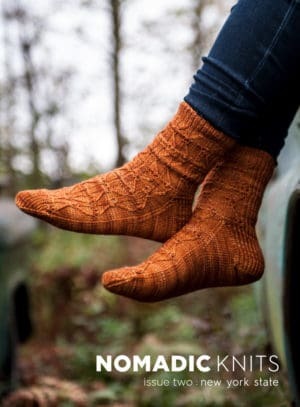 Nomadic Knits is a boutique magazine featuring beautiful patterns — highlighting the best regional fiber growers and processors, dyers, and local yarn shops.